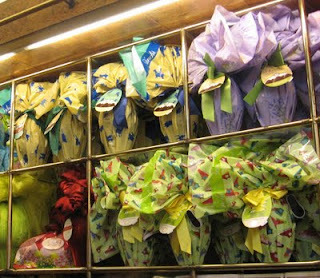 Many Bergamo shops are tempting customers with colourful displays of Easter eggs such as the one pictured here. Italian Easter eggs are usually wrapped artistically in coloured cellophane and tied with pretty ribbons. They often contain a toy, or in the case of Easter eggs for adults, a gift, which can sometimes be as substantial as a mobile phone! There are some fascinating chocolate and cake shops in Via Colleoni in the Città Alta (upper town) and down in the Città Bassa (lower town) there is a well-stocked chocolate and sweet shop in Via Tiraboschi, a left turn off Viale Papa Giovanni XXIII at Largo Porta Nuova. The shop also sells a selection of boxes of chocolates and biscuits -- ideal to take home as holiday presents. On Easter Sunday in Bergamo the restaurants are busy at lunchtime as families go out to celebrate la Pasqua (Easter) together and many will be serving a special menu. A traditional Easter meal for Italian families, whether they are eating at home or in a restaurant, is likely to centre round agnello (lamb) as the main course, either roasted or braised. For dessert there will usually be la Colomba, the dove shaped cake that is traditional at Easter, in the same way that il Panettone is traditional at Christmas. La Colomba (the dove) is known as the bird of peace and there is a legend that says a cake in the shape of a dove was offered to try to end a siege at Pavia . But there is also the theory that the cake was created in the 1930s by a firm in Milan who wanted to provide a cake for Easter that was the equivalent to il Panettone. La Colomba is now sold all over Italy but is also made in the home. The traditional version has an almond and sugar topping, but these days the shops sell them with all kinds of fillings, icings and toppings. Love to see more amazing posts like this one.